Proper pond maintenance requires you routinely checking your pond’s pH, hardness and alkalinity every three to five years. There are times, however, that the normal levels become interrupted and require additional tests. When this occurs, adding lime helps stabilize the pH of mud on the bottom and increases the phosphorus content, necessary for fish growth and reproduction. The over or undergrowth of algae in a pond may indicate the need for lime. Planktonic algae blooms give the pond a green hue and are important for a thriving pond, since they provide food for insects and small fish. Generally, bloom occurs after pond fertilization in the spring. However, when plankton bloom fails to occur after the recommended fertilization, it's often the first sign lime is needed, according to the University of Georgia School of Forest Resources. Measuring the hardness, or levels of calcium, magnesium and other minerals, helps determine if your pond needs lime. Test strips available from your many garden or pond supply stores allow you to test a water sample. The acceptable level for hardness is between 150 and 300 ppm, according to the Pennsylvania State University website. If the hardness is less than 10 ppm, which is common in southern states, one ton of agriculture lime should be added per acre of water to bring the hardness levels up appropriately. Unacceptable alkalinity levels indicate lime is needed. The alkalinity of the water in your pond determines how quickly it neutralizes acids, such as urine. The appropriate level is between 40 and 120 ppm. Any measurement less than 20 to 40 ppm indicates lime is needed. Generally, 50 pounds of lime per acre of water is the amount necessary to bring the pH up between 7 and 8.5. Adding lime in the fall or winter allows hardness to reach the proper levels before spring fertilization. For a new pond, the University of Georgia School of Forest Resources recommends spreading lime on the ground before filling it. For existing ponds, a boat works well when spreading a large amount of lime since it should be spread over the entire pond instead of dumped in one place. For large amounts of lime, add it along several locations near the banks to ensure proper distribution. Penn State College of Agriculture Science: What is Wrong with my Pond? Virginia Cooperative Extension: What is Liming? Amanda Maddox began writing professionally in 2007. Her work appears on various websites focusing on topics about medical billing, coding, real estate, insurance, accounting and business. Maddox has her insurance and real estate licenses and holds an Associate of Applied Science in accounting and business administration from Wallace State Community College. Why Are My Pond Fish Dying? What pH Level is Safe for a Koi Pond? How Much Salt Is Needed for a Fish Pond? Why Is My Pond Alkaline? 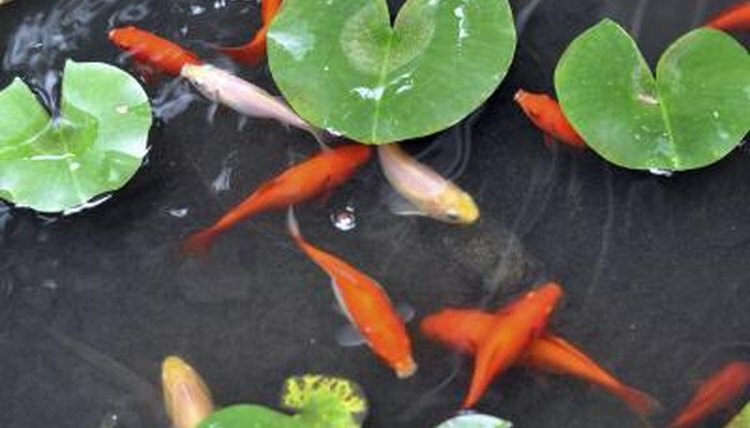 At What Temperature Should You Keep Your Koi Fish Tank? How Do I Clear Up a Milky Goldfish Pond? What Can Excessive Phosphates Do to an Aquarium? What Happens if the Alkalinity Rises Too High in an Aquarium? What Kind of Water Should I Use on a Freshwater Fish Tank?